This post isn’t some sort of “How to” article with a formula how you can travel for over one year. Because let’s face it, everyone has different lives and there are different factors that influence how long you can travel and whether you can travel at all. Like I’ve mentioned before, I don’t believe in the whole “everybody can travel” crap, because it’s just not true. Most (not all of them!) people in my direct environment can travel like Jeffrey and I. But so many people in this world aren’t in such a great position of freedom and possibilities. One of my first posts was “How to plan a world trip” and I realize now that it’s not that simple. But, a lot of people have reached out to us and asked how we have managed to travel for 18 months, and asked for tips and advice. They especially wanted to know how we did it financially. And although I know everyone has a different situation, meaning this post won’t be helpful for many, I do like to have some transparency with regards to how we have funded our travels and how we went about it. 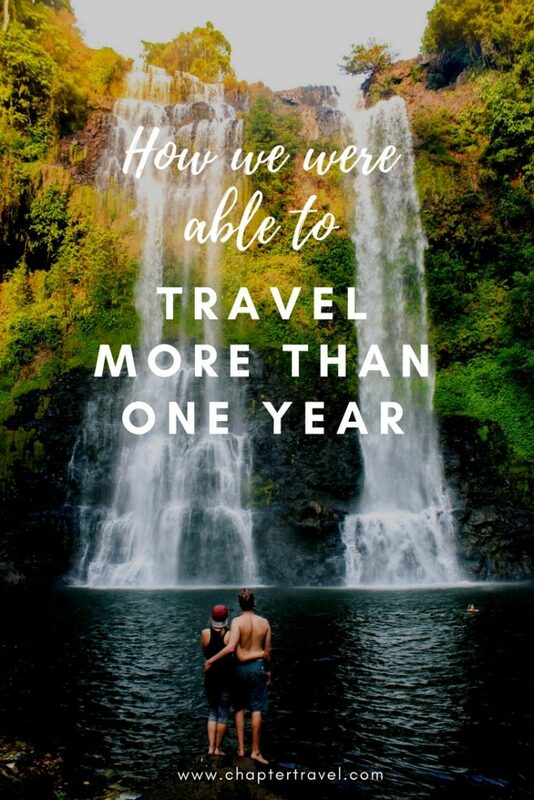 This post is plain and simple; I will tell you how WE managed to travel for over a year. I give some tips here and there, and I really do hope it’s useful for some! There is no secret formula that we used, even though a lot of people (e.g. strangers on Instagram) think we do. But then again, if there is a secret formula, would I share it? First of all, we were both lucky to have a Dutch passport that makes it possible for us to enter all the countries we wanted to visit. It was also very easy for us to get the necessary Visa’s, although I needed to answer some additional questions for the Australian Visa. Probably because I was a student at the time of application, meaning that I didn’t have a real income yet. We were both healthy and we didn’t have any responsibilities. This is still the case, by the way. With responsibilities I mean that we don’t have a house, children, nor do we have family members we need to take care of. I do have a student debs, but in The Netherlands you don’t have to pay them off right away. I’ll start paying them off next year and we have a special system for this in our country, and it goes by income. It’s not very exciting, but basically we just saved up some money before we left. Both Jeffrey and I had around 7000 in our bank accounts before we left our home country. We suggest to have at least 2000 euros/dollars in your bank account to get started on a big trip. More is better of course, and take into account if you’re able to work during your trip. We both had approximately 7000 euros in our bankaccounts, so 14.000 euros in total. Put the same amount of money aside every month. Cancel subscriptions you don’t use (e.g. that gym you go to once a year). Try not to buy stuff you don’t really need, such as new clothes. If you really need some new pants you can always try second hand. This is cheaper and often even very fashionable too. Go to cheaper markets to get groceries instead of the supermarket. If you go to the supermarket choose the cheapest brands. You can still do fun stuff, try looking up free stuff to do in your own city. Hang out with friends at home more – rent a movie, watch Netflix. Just sent out as many applications as possible. Print out your resume 50 times and start giving them at local shops and restaurants. Nowadays it’s fairly easy in most countries to look for a job online. Don’t be picky, it’s not a job for the rest of your life. If you can get a job take it! Ask around in your environment. Perhaps one of your family members can help you to get a job? Get some extra income by getting an extra (online) job. I bet you have seen this a lot of times, in a lot of blogs. “We sold our house to travel!” But yeah, not everybody has a house to sell. We didn’t have anything huge to sell either. But I did have a lot of clothes, and I decided to sell this on a flee market and online. It’s wasn’t much extra, around 100-200 euros. Jeffrey had some stuff to sell too, and put it online. If you have anything to sell that is worth something, try to sell it online. Most countries have a market place online, even often on Facebook groups and such. If you have a lot of crap, like me, just try to sell it on a flee market. If 70 people buy something from you for two euros, you still made 140 euros. We bought our one-way tickets to Australia nine months before we left and we paid 500 euros each. Usually the prices of the tickets to Australia from the Netherlands are much higher. It really pays off if you book well up front! If you don’t have a specific country in mind to travel to, it is also very fun to go to Skyscanner and typ in Everywhere in the box of where you want to go. That way you can easily find cheap tickets to all sorts of destinations. This isn’t really exciting, but necessary before you go on a big trip. Arrange Visa’s, make sure your passport is up to date, check what kind of health insurance you can get. I know health insurance is different for every country, but for instance for Australia some countries can get a Medicare Card. Also, cancel phone numbers, gym, magazine and other subscriptions. Just make sure you don’t need to pay anything you don’t need to have during your travels. Don’t wait with all this stuff until the end! Our first stop was Australia, which is a quite expensive country. But, we tried to stay on a budget of 30 euro per person a day, including everything. Of course, some days we spent more and others less than 30 euros per person. After Australia we went to Asia, and it was a lot easier to stay on our budget. Most Asian countries are really affordable, and we suggest to go there if your budget isn’t very big. Eat cheap by doing groceries or only choosing affordable local restaurants. Especially in Asia this is easy to find. In most countries in Asia it is not necessary to do groceries, as the local restaurants are often very reasonably priced plus delicious too. Do it yourself or be picky with tours. Sometimes it’s okay to go over your budget and go with the better tour, but only if it’s worth it. Look up reviews. Balance it out. If you spent more than your budget one day, even it out the next day. Travel by bus. In most countries this is the cheapest way. In some countries it’s also affordable to travel and live in a camper van. House sitting is a great way to save money on accommodation. Other great options are airbnb and hostels. In most countries in Asia we noticed that hostels/dorms weren’t necessarily cheaper than hotels, especially as a couple. Because we were lucky to be able to get a Working Holiday Visa in Australia, we were allowed to get a job. We eventually choose to work in the outback, because we could get accommodation plus food next to our wage. It was an easy way to save money very fast. We both earned enough money to travel for another year (on a budget) by only working for six months. Of course, with this part it also really depends which country you are from, which country you would go to and what kind of Visa you can get. There are different protocols in each country. Not all countries offer a Working Holiday Visa and there are often a lot of rules too (e.g. often you have to be younger than 30). This post shows some countries that offer a Working Holiday Visa. We actually wanted to go to South America, but we heard it can expensive to travel around. Therefore after Australia we decided to go to Southeast Asia. We knew we could do more with our budget there. And this proved to be true, we could easily live of our budget here and enjoy good food, accommodation and do fun activities. However, some of the expensive destinations we went to were Australia, Japan and Korea. Although it was more challenging to stay on our budget there, it was not impossible. Personally, we thought Korea was the most challenging country to stay on our budget. We didn’t eat very healthy here, for instance way to much instant noodles. But it was possible! In Japan we were surprised to how easy it was. We ate a lot of ramen for 7/8 euros, bought cheap sushi from the local supermarkets and most activities we did were free or affordable. Australia is the same way, here we made our own food and barely went out to dinner. Our activities mostly consisted exploring the landscape. Some people think we were able to fund our travels with our blog and social media channels. Unfortunately for us, this isn’t true. However, we do have the occasional complimentary stay and tour, which of course makes it easier to save money. Now and then we get some brand collaborations which puts a bit of money in the pocket, but not enough at all to travel all the time. As I am trying to be transparant, I would also like to add that it has never been my intention to make a living with our blog. The reason I started this blog was actually because I wanted to give myself a goal while being away. I knew I would be away for a long time, and I wanted something to show for once I got back. Plus, my passion has always been writing, which was why starting a blog was a quite obvious choice for me. So, no, it wasn’t to make money, nor was it merely to keep friends and our families up to date, it was to learn something new. How I could create a website, learn about SEO, various social media channels and improve my writing skills. After being a amateur travel blogger for a few months, some possibilities came knocking and I took them. Currently, both Jeffrey and I are looking into what we would like to do career wise. And of course, keep traveling whenever possible. This blog is a nice way to earn a little on the side, share our stories, and to improve our skills. Of course, I’m always looking to improve and love looking for opportunities. But still, it’s not my goal to make it my career at this point. I’m thinking of something with a bit more of a secure income – no not an office job, without working every hour of the day. Seriously, it’s really a lot of work to be a full-time travel blogger. Just read this article by Jessica Teich from the New York Times. This is a great guide for people that want to start a travel blog by Expert Vagabond. We hope this story of how we funded our travels helps a bit if you have the desire to do the same. Again, I realise that not everybody can travel. Everyone has a different situation, you might have some kids running around you at this moment. Or you might be paying off student debts right now. A step to step guide on how to travel the world is not possible, as it can’t address everyone’s personal situation. I appreciate this honest approach! I wish more bloggers would give real insight into how they travel so often and how much it costs… transparency is key and it’s so true that not everyone has the same opportunities when it comes to travel! Great article Lisanne! I think it will help a lot of people realize how they can travel for a longer time as well (especially from Europe/America). Hope to see you soon! Thanks Jess! I hope so :). See you soon! Great post, love th honesty and it raises great points and ideas for me for future planning! We’re looking to do a travelling honeymoon so this has given me plenty to think about. That would be amazing. Hope you have a fantastic honeymoon Laura! Impressive! Starting out with just 2,000 Euros apiece sounds absolutely terrifying. I went to France from the States last year and the airfare alone cost about $1,500. Crazy! I love that you guys were able to work on the road and extend your travels. Sounds like quite the adventure! Hi Beth! Sorry if we confused you, but we had more than 2000 euros a person :). We recommend to have that as a start, but more is better – will edit that. Also, this is excluding airfare, we mean the money you have in your bank when you leave. Thanks so much for your thoughtful comment! Congratulations on getting to travel for so long. This dream sounds amazing. I really want to try to do this. Thanks for the inspiration. This is so great! I would love to travel the world but just going out of state can be hectic with 4 kids lol. This is my husbands and I goal for when then are older and out of the house! Glad you are getting to do it now!